Get seamless Integration between RateManager and BookingCenter PMS data. Get seamless Integration between RateManager and BookingCenter PMS data with Rate Intelligence/Rate Manager Tools. BookingCenter has been partnering with Rate Manager, a subsidiary of Priceline / Booking.com to provide awesome technology. 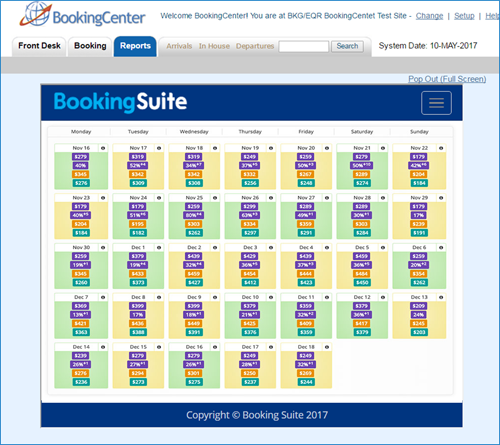 Our partnership provides BookingCenter clients with seamless access to RateManager’s array of products that are cost-effective and ‘built into’ BookingCenter. Integration between the Booking.com RateManager and BookingCenter PMS data enables Booking.com’s ‘big data’ analysis of supply and demand trends in your market like a “comp set” of competitive hotels, travel trends, etc. The RateManager uses this analysis to automatically update rates in your PMS.